This example shows how to isolate a speech signal using a deep learning network. The cocktail party effect refers to the ability of the brain to focus on a single speaker while filtering out other voices and background noise. Humans perform very well at the cocktail party problem. 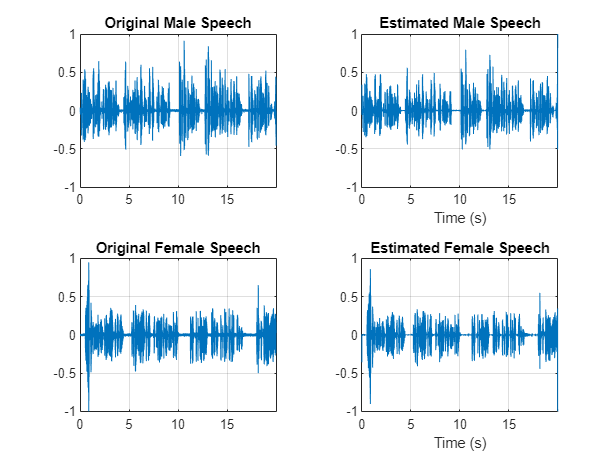 This example shows how to use a deep learning network to seperate individual speakers from a speech mix where one male and one female are speaking simultaneously. 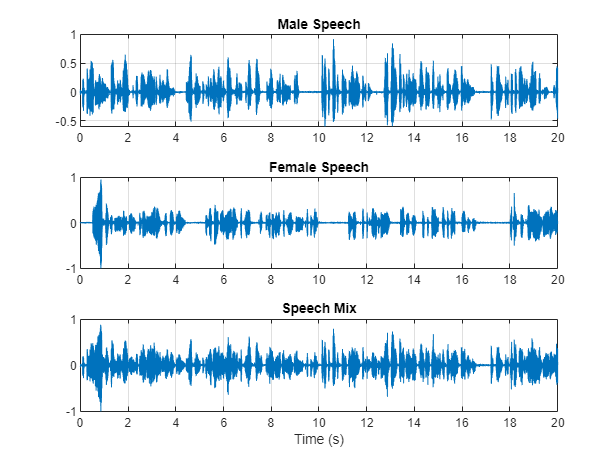 Load audio files containing male and female speech sampled at 4 kHz. Listen to the audio files individually for reference. Combine the two speech sources. Ensure the sources have equal power in the mix. Normalize the mix so that its max amplitude is one. Visualize the original and mix signals. Listen to the mixed speech signal. 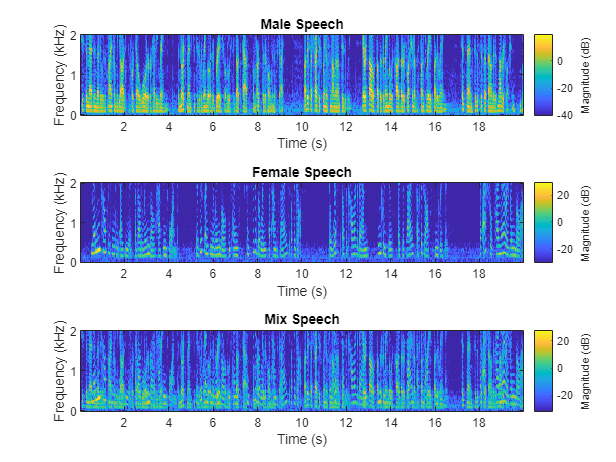 This example shows a source separation scheme that extracts the male and female sources from the speech mix. Listen to the mix audio. 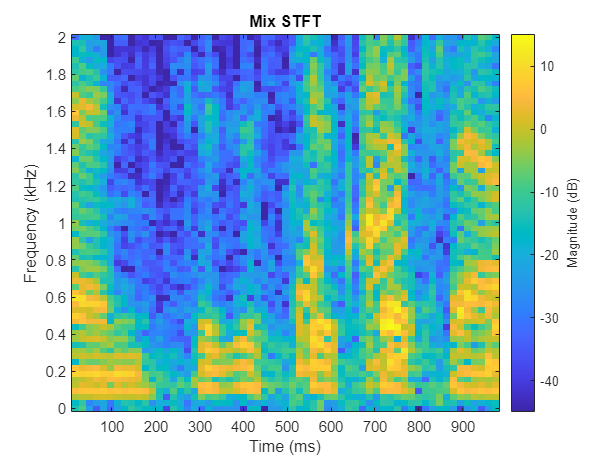 Use stft to visualize the time-frequency (TF) representation of the male, female, and mix speech signals. Use a Hann window of length 128, an FFT length of 128, and an overlap length of 96. The application of a TF mask has been shown to be an effective method for seperating desired audio signals from competing sounds. A TF mask is a matrix of the same size as the underlying STFT. The mask is multiplied element-by-element with the underlying STFT to isolate the desired source. The TF mask can be binary or soft. In an ideal binary mask, the mask cell values are either 0 or 1. If the power of the desired source is greater than the combined power of other sources at a particular TF cell, then that cell is set to 1. Otherwise, the cell is set to 0. Compute the ideal binary mask for the male speaker and then visualize it. 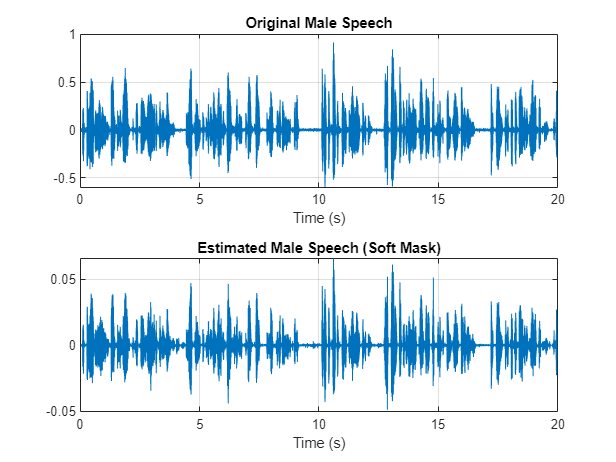 Estimate the male speech STFT by multiplying the mix STFT by the male speaker's binary mask. 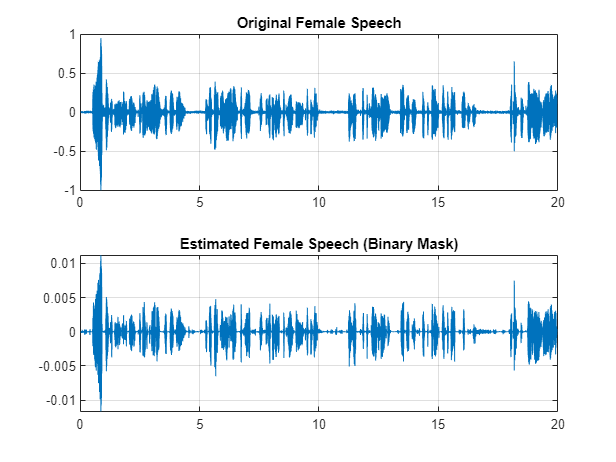 Estimate the female speech STFT by multiplying the mix STFT by the inverse of the male speaker's binary mask. Estimate the male and female audio signals using the inverse short-time FFT (ISTFT). Visualize the estimated and original signals. Listen to the estimated male and female speech signals. In a soft mask, the TF mask cell value is equal to the ratio of the desired source power to the total mix power. TF cells have values in the range [0,1]. Compute the soft mask for the male speaker. Estimate the STFT of the male speaker by multiplying the mix STFT by the male speaker's soft mask. 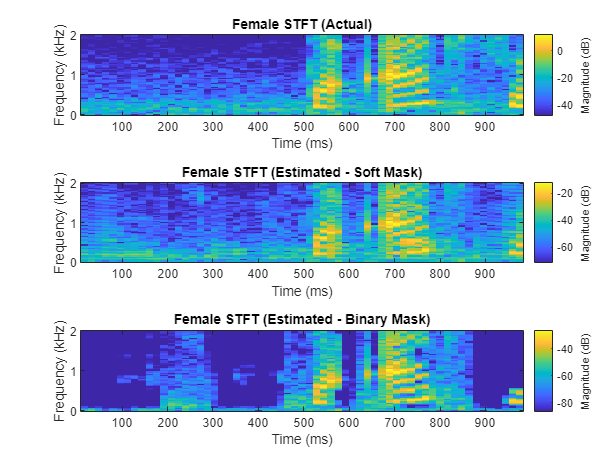 Estimate the STFT of the female speaker by multiplying the mix STFT by the female speaker's soft mask. Estimate the male and female audio signals using the ISTFT. Visualize the estimated and original signals. Listen to the estimated male and female speech signals. Note that the results are very good because the mask is created with full knowledge of the seperated male and female signals. The goal of the deep learning network in this example is to estimate the ideal soft mask described above. The network estimates the mask corresponding to the male speaker. The female speaker mask is derived directly from the male mask. The basic deep learning training scheme is shown below. The predictor is the magnitude spectra of the mixed (male + female) audio. The target is the ideal soft masks corresponding to the male speaker. The regression network uses the predictor input to minimize the mean square error between its output and the input target. At the output, the audio STFT is converted back to the time domain using the output magnitude spectrum and the phase of the mix signal. You transform the audio to the frequency domain using the Short-Time Fourier transform (STFT), with a window length of 128 samples, an overlap of 127, and a Hann window. You reduce the size of the spectral vector to 65 by dropping the frequency samples corresponding to negative frequencies (because the time-domain speech signal is real, this does not lead to any information loss). The predictor input consists of 20 consecutive STFT vectors. The output is a 65-by-20 soft mask. You use the trained network to estimate the male speech. The input to the trained network is the mixture (male + female) speech audio. This section illustrates how to generate the target and predictor signals from the training dataset. 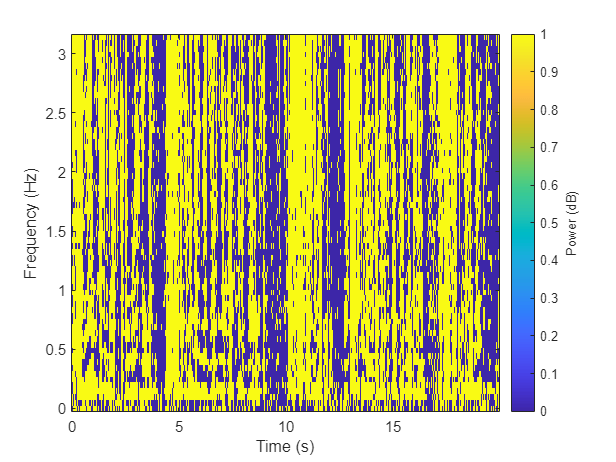 Read in training signals consisting of around 400 seconds of speech from male and female speakers, respectively, sampled at 4 kHz. The low sample rate is used to speed up training. Trim the training signals so that they are the same length. Scale the training signals to the same power. Scale the validation signals to the same power. Create the training and validation "cocktail party" mixes. Since the stft input is real, the stfts are conjugate symmetric. Reduce the stfts to their unique samples. Take the log of the mix STFT. Normalize the values by their mean and standard deviation. Generate validation STFTs. Take the log of the mix STFT. Normalize the values by their mean and standard deviation. 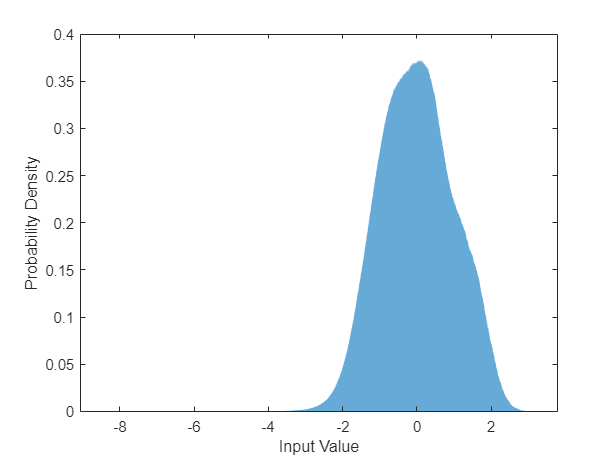 Training neural networks is easiest when the inputs to the network have a reasonably smooth distribution and are normalized. To check that the data distribution is smooth, plot a histogram of the STFT values of the training data. Compute the training soft mask. Use this mask as the target signal while training the network. Compute the validation soft mask. Use this mask to evaluate the mask emitted by the trained network. To check that the target data distribution is smooth, plot a histogram of the mask values of the training data. Create chunks of size (65,20) from the predictor and target signals. In order to get more training samples, use an overlap of 10 segments between consecutive chunks. Create chunks of size (65,20) from the validation predictor and target signals. Reshape the training and validation signals. Define the layers of the network. Specify the input size to be images of size 1-by-1-by-1300. Define two hidden fully connected layers, each with 1300 neurons. Follow each hidden fully connected layer with a sigmoid layer. 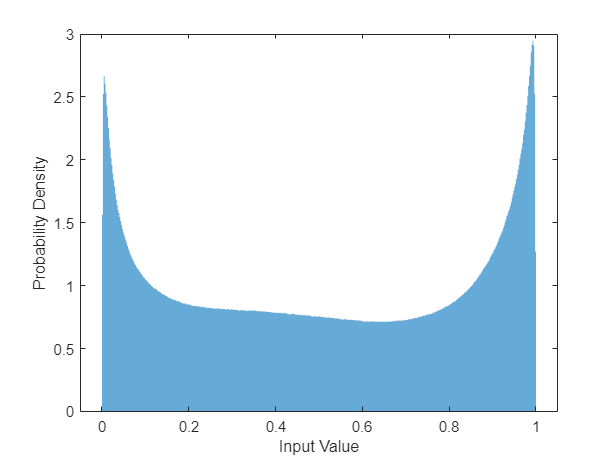 The batch normalization layers normalize the means and standard deviations of the outputs. Add a fully connected layer with 1300 neurons, followed by a regression layer. Specify the training options for the network. Set MaxEpochs to 3 so that the network makes three passes through the training data. Set MiniBatchSize to 64 so that the network looks at 64 training signals at a time. Set Plots to training-progress to generate plots that show the training progress as the number of iterations increases. Set Verbose to false to disable printing the table output that corresponds to the data shown in the plot into the command line window. Set Shuffle to every-epoch to shuffle the training sequences at the beginning of each epoch. Set LearnRateSchedule to piecewise to decrease the learning rate by a specified factor (0.1) every time a certain number of epochs (1) has passed. Set ValidationData to the validation predictors and targets. Set ValidationFrequency such that the validation mean square error is computed once per epoch. This example uses the adaptive moment estimation (ADAM) solver. Train the network with the specified training options and layer architecture using trainNetwork. Because the training set is large, the training process can take several minutes. To load a pre-trained network, set doTraining to false. Pass the validation predictors to the network. The output is the estimated mask. Reshape the estimated mask. 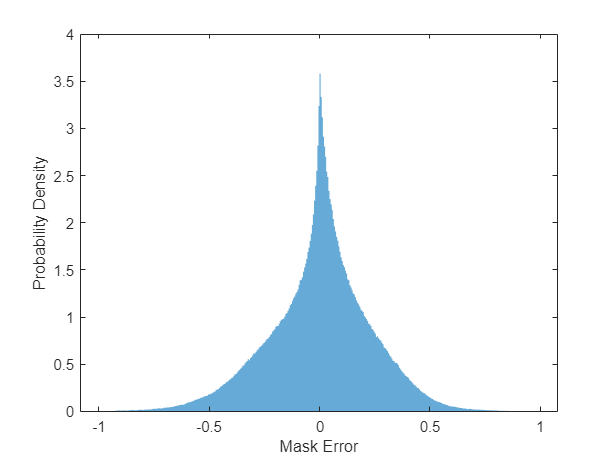 Plot a histogram of the error between the actual and expected mask. Estimate male and female soft masks. Estimate male and female binary masks by thresholding the soft masks. Shorten the mix STFT to match the size of the estimated mask. Multiply the mix STFT by the male soft mask to get the estimated male speech STFT. Use the ISTFT to get the estimated male audio signal. Scale the audio. Visualize the estimated and original male speech signals. Listen to the estimated soft mask male speech. Multiply the mix STFT by the female soft mask to get the estimated female speech STFT. Use the ISTFT to get the estimated male audio signal. Scale the audio. Visualize the estimated and original female signals. Listen to the estimated female speech. Estimate male and female binary masks by thresholding the soft masks. 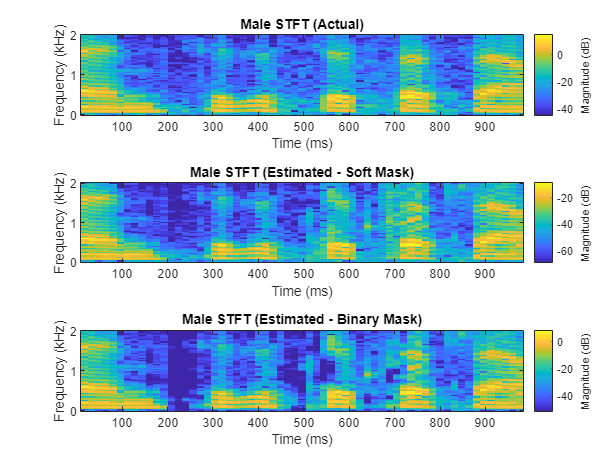 Multiply the mix STFT by the male binary mask to get the estimated male speech STFT. Use the ISTFT to get the estimated male audio signal. Scale the audio. Visualize the estimated and original male speech signals. 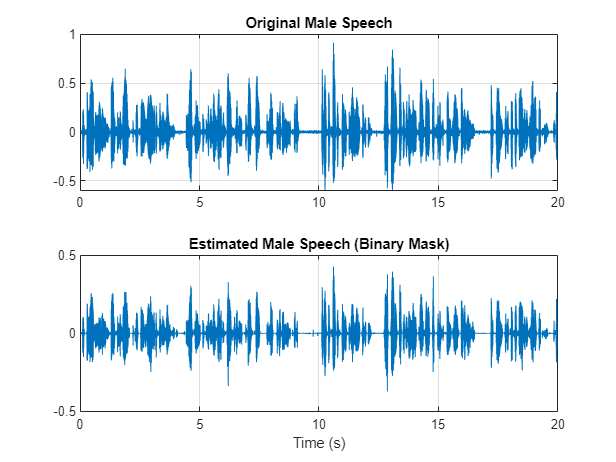 Listen to the estimated binary mask male speech. Multiply the mix STFT by the female binary mask to get the estimated male speech STFT. Use the ISTFT to get the estimated male audio signal. Scale the audio. 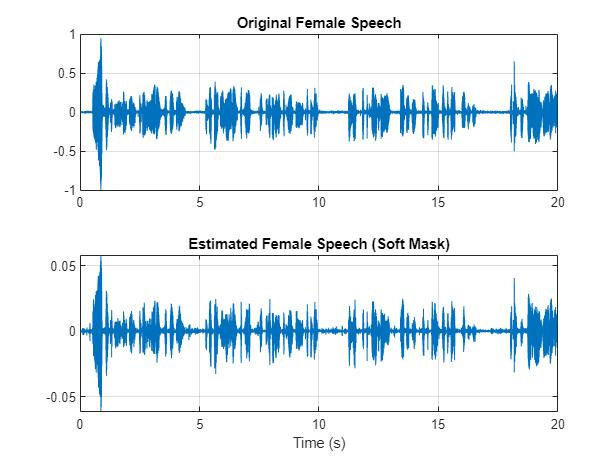 Visualize the estimated and original female speech signals. Listen to the estimated female speech. Compare STFTs of a one-second segment for mix, orignial female and male, and estimated female and male, respectively. "Probabilistic Binary-Mask Cocktail-Party Source Separation in a Convolutional Deep Neural Network", Andrew J.R. Simpson, 2015.